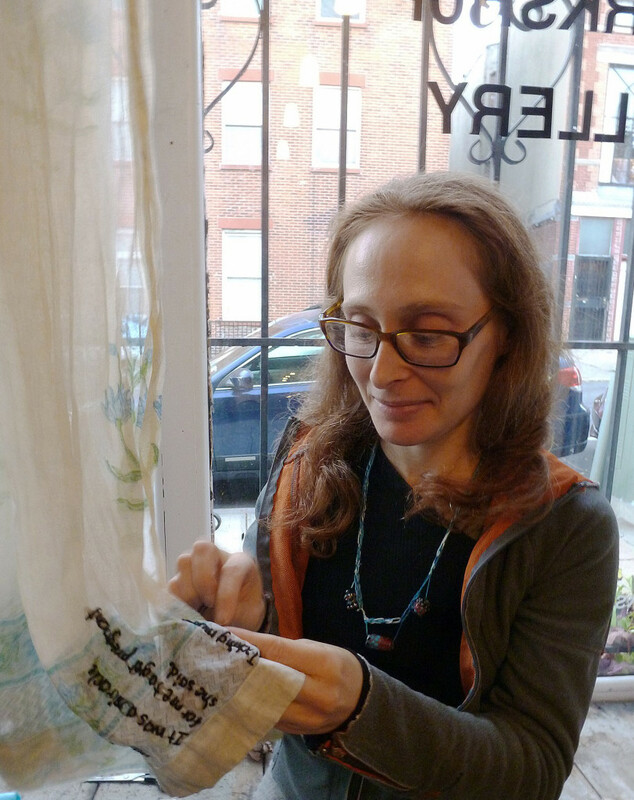 In 2015, with a Brooklyn Arts Council Community Arts Fund grant, I’m creating Native/Immigrant City, handheld fabric sculptures I embroider with stories of assimilation, acculturation, adaptation from natives, immigrants and transplants from other US states to Brooklyn. As part of this project, I lead embroidery circles where we share NYC memories, as in these images below. 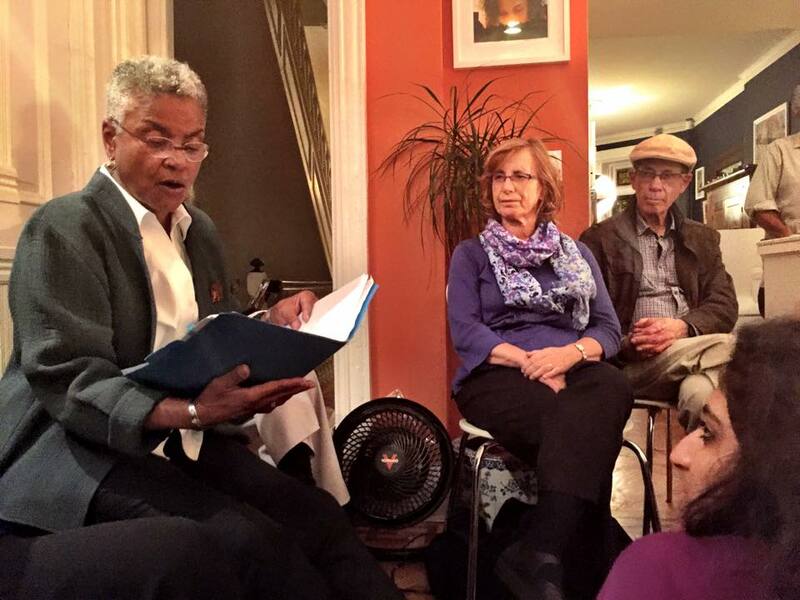 2015 Embroidered Storytelling Circle at 61 Local for BAC sponsored Native/Immigrant City project. 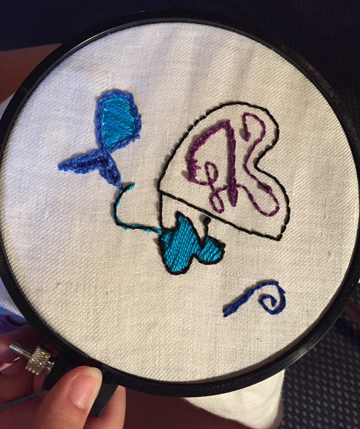 Embroidered Storytelling Circle participant, Cristina Ferrigno’s, “sampler.” 8/12/2015. 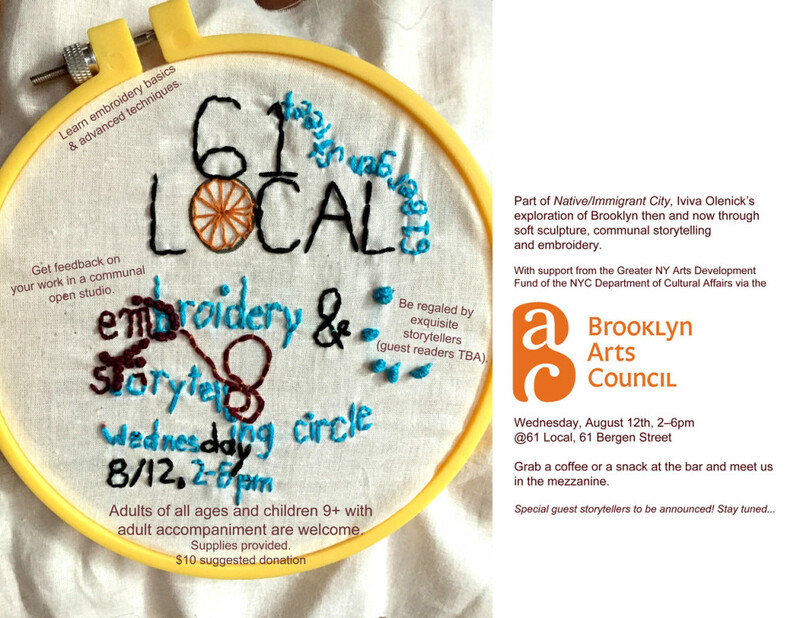 Invitation to BAC-sponsored Embroidered Storytelling Circle at Brooklyn’s 61 Local. 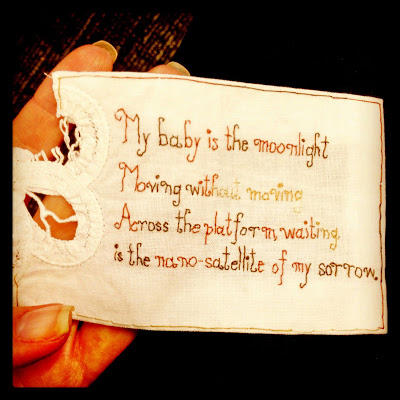 As poets and storytellers performed, I stitched their select words on fabric, later cutting out separate embroideries and giving them to performers. 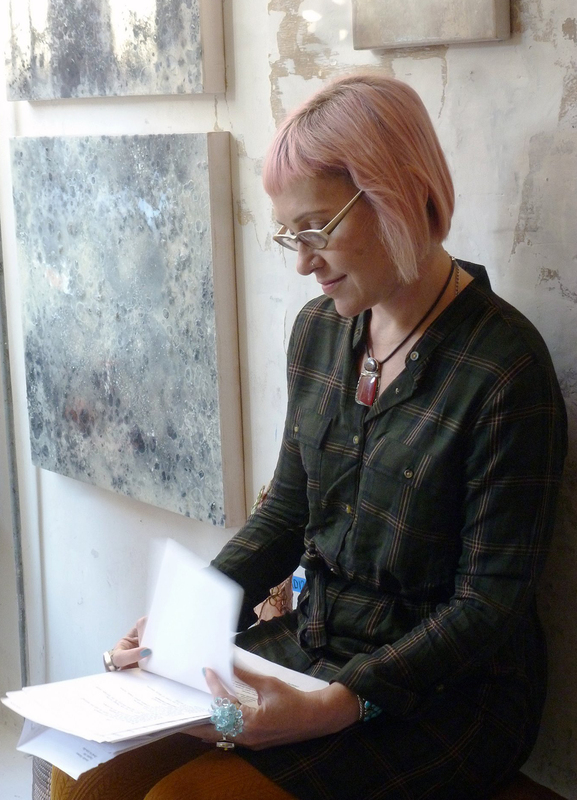 Poet, Jen Gersbeck reading “Vision Poems” about her mom, 11/8/15. Richie Alexandro reading as I ponder which words to embroider. 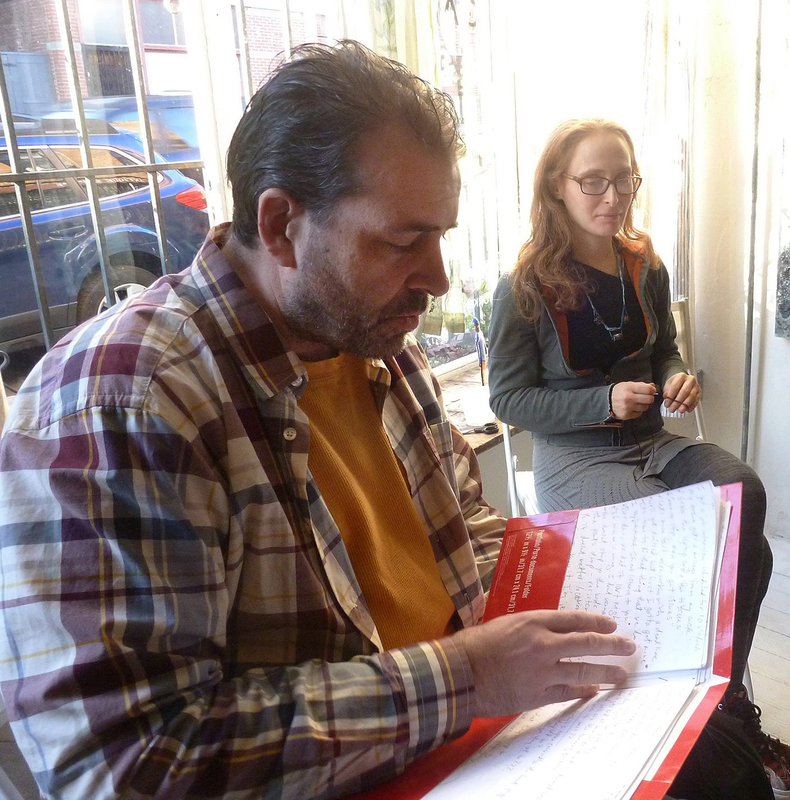 Guests enjoying each others’ words at Embroidered Poetry and Storytelling Circle, the finale of Native/Immigrant City at Brooklyn Workshop Gallery/ Workshop Gallery Artists Foundation. Quote from one of Tristan Franz’s poems capturing the frenetic pace and human density of NYC on the subway. Native/Immigrant City sculptures on display in the window at Brooklyn Workshop Gallery/Workshop Gallery Artists Foundation. 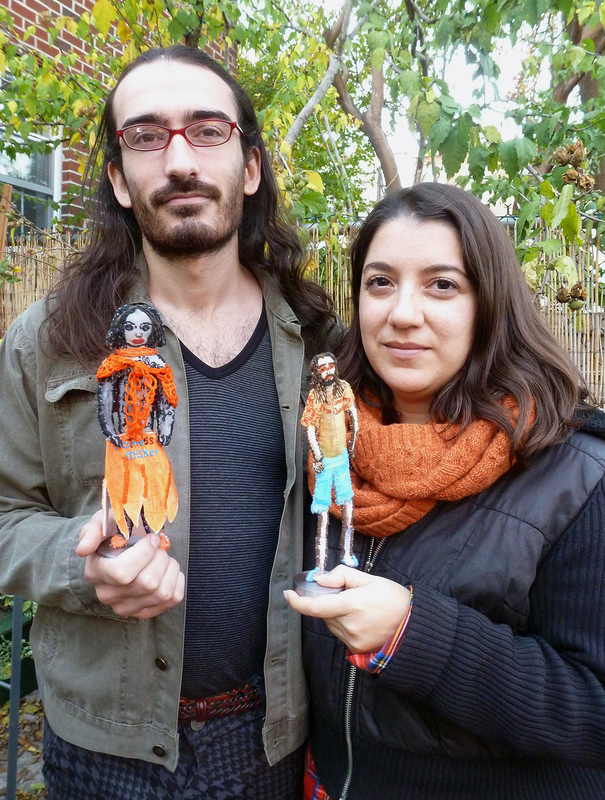 In the garden of Brooklyn Workshop Gallery, guests hold my Native/Immigrant City sculptures made in their likenesses. 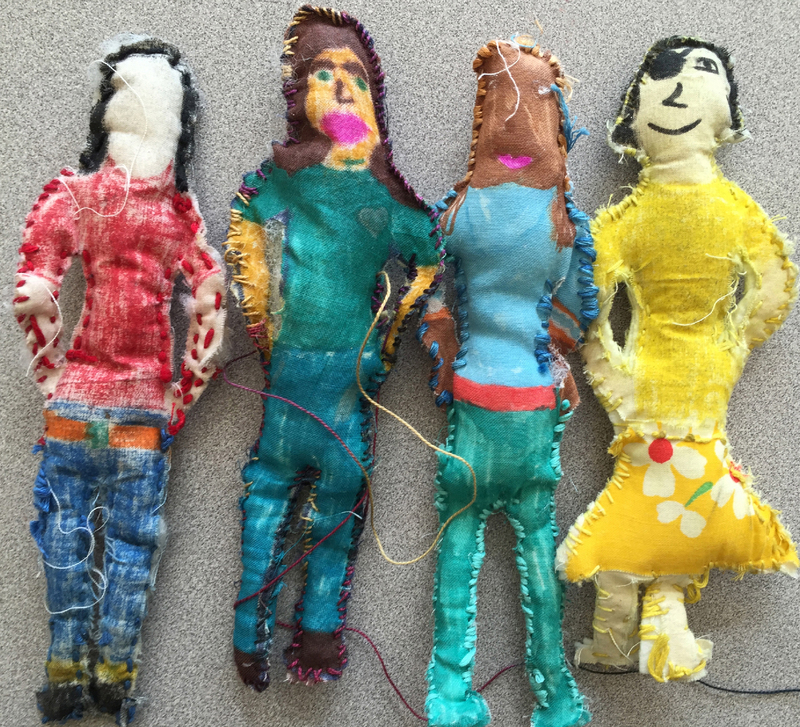 At a middle school after school program in Flatbush, Brooklyn, I had a core group of dedicated students who completed stitched and stuffed “selfies.” Some of these pieces physically reference and resemble the makers, while others are simply exercises in technique. 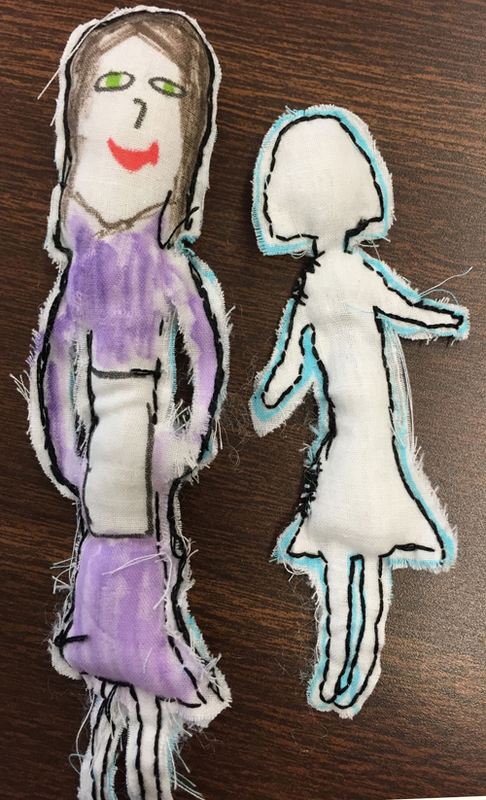 2nd graders in another after school program interviewed relatives who had immigrated to the US, and made these hand drawn and stitched dolls of them. 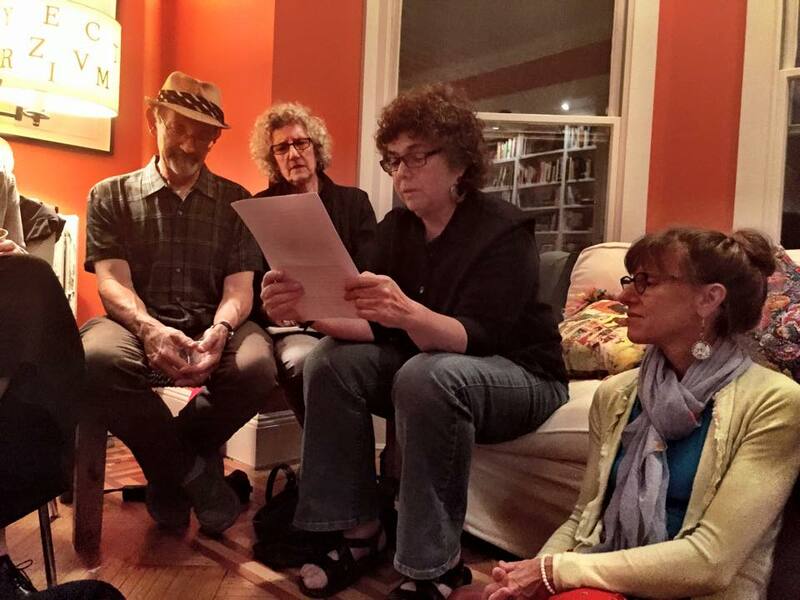 In fall 2015, Jenny Douglas of the Brooklyn Cottage, a Prospect Heights creative lab, and I co-curated an evening of readings by writers ages 60+. 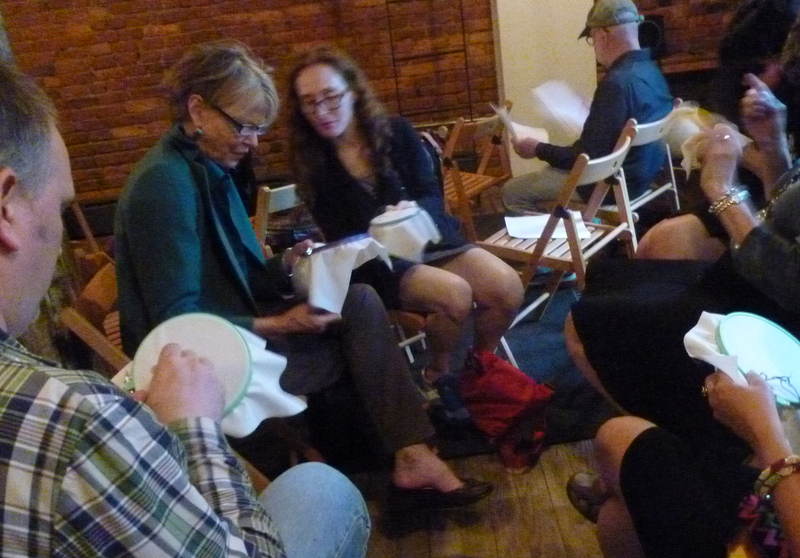 Invited performers and self-recruited performers shared their works in a supportive, cozy environment. The enthusiastic turnout, with guests of all ages, emphasized the need for more intergenerational cultural events and opportunities for seniors to lead creative activities. 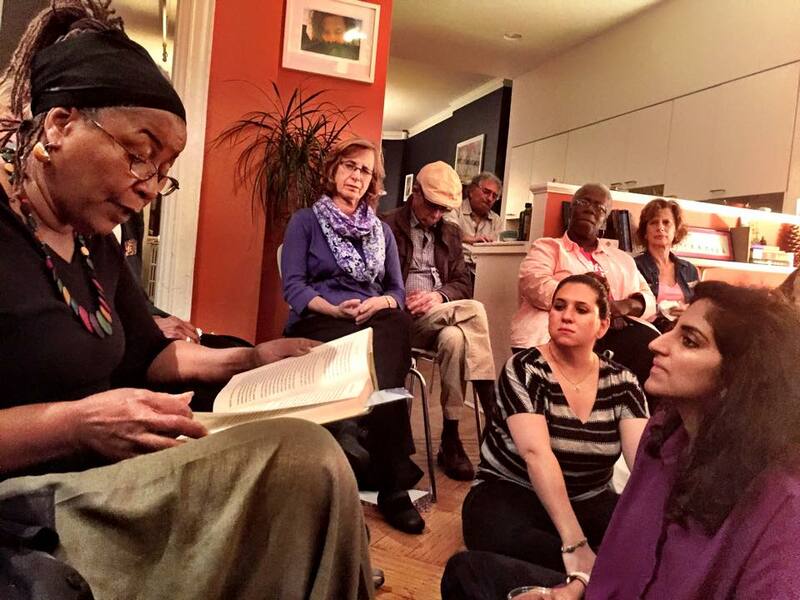 Alice Schechter performing a memoir-like short story. 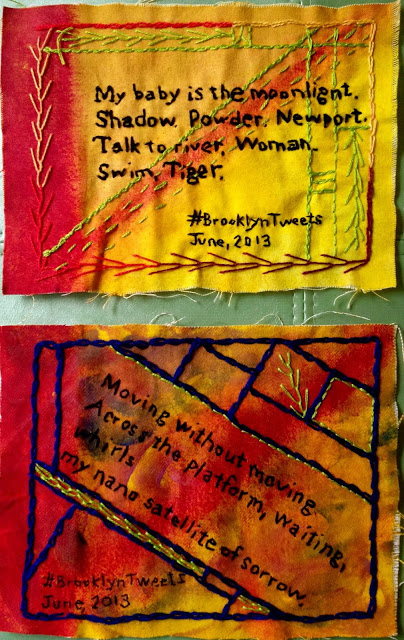 In 2013, with support from a Community Arts Fund grant from the Brooklyn Arts Council, I spearheaded @EmbroideryPoems, using Twitter to follow other poets, and post my own 140 or fewer character verses. 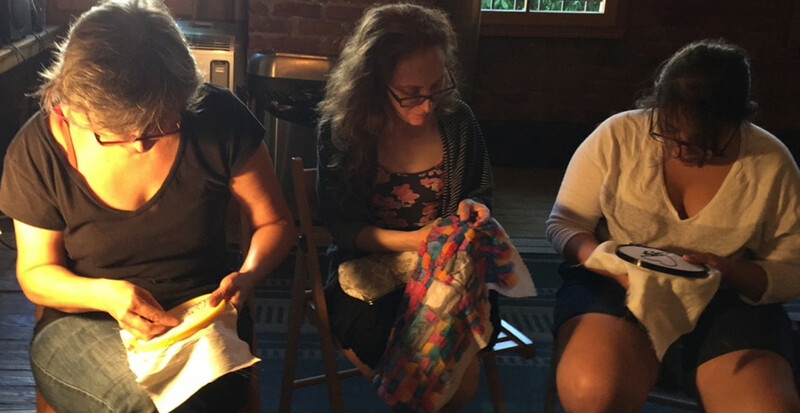 At an event open to the public, hosted by 61 Local in Brooklyn, poets recited and musicians played as an embroidery circle I trained captured select words in stitch. 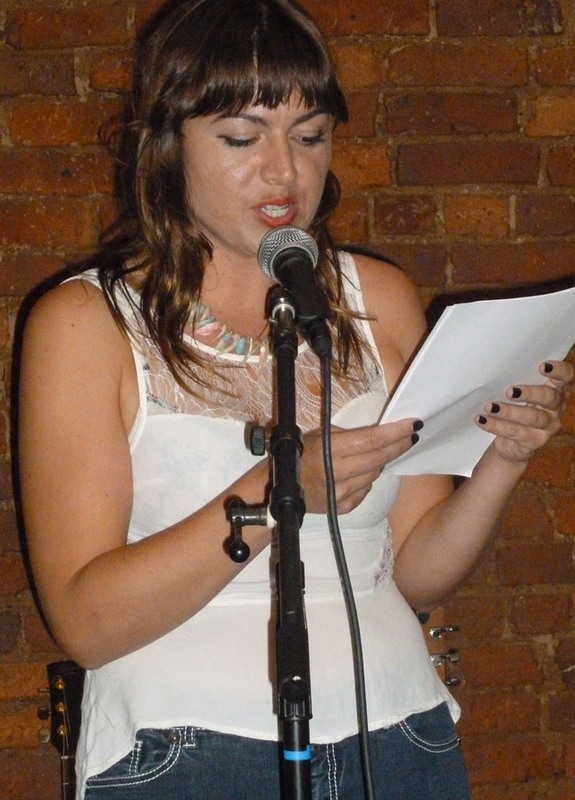 Below are some images from this Embroidered Poetry Slam. 2013 Embroidered Poetry Slam Circle at 61 Local, Brooklyn, NY. 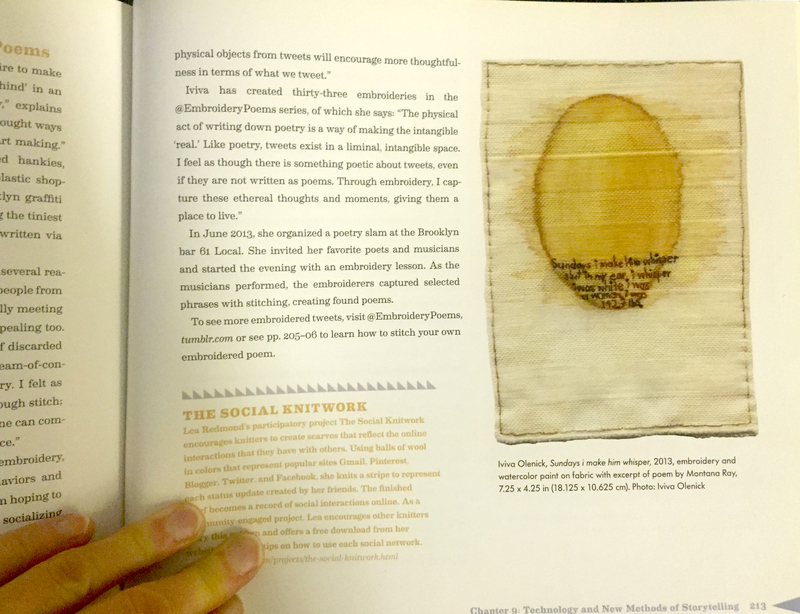 Before poets and musicians performed, I taught embroiderers basic stitches in preparation for capturing select performers’ words in thread. Blissful embroiderers at 2013 61 Local Embroidery Slam. Montana Ray reading poems at 61 Local Embroidery Slam. 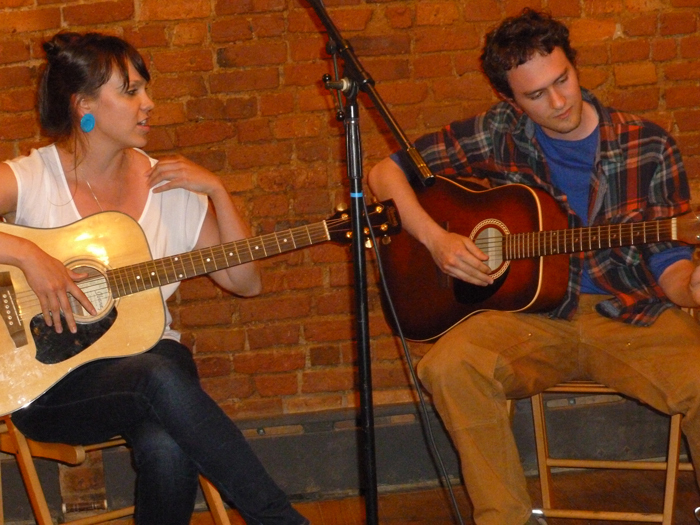 Cristina Martin and Jared Green perform improvised and rehearsed music for Embroidery Slam. 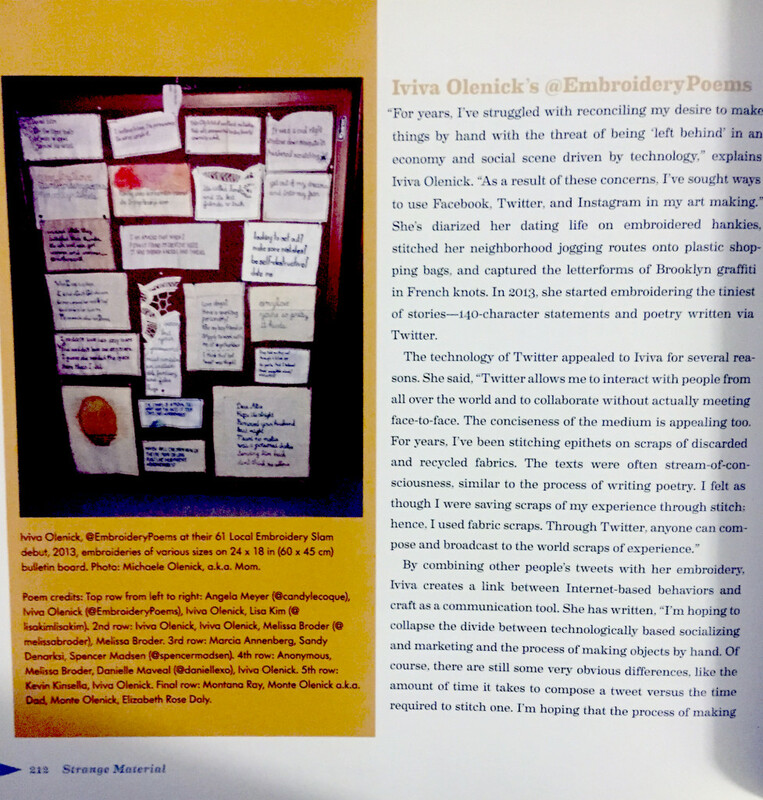 One of the guests, Olisa Corcoran and I decided to send each other our embroidered poems. We didn’t even discuss the trade; we both had the same impetus!! This is my @EmbroideryPoems poem for Olisa. Olisa sent me these colorful painted embroideries with text similar to what I’d captured from the Embroidery Slam. 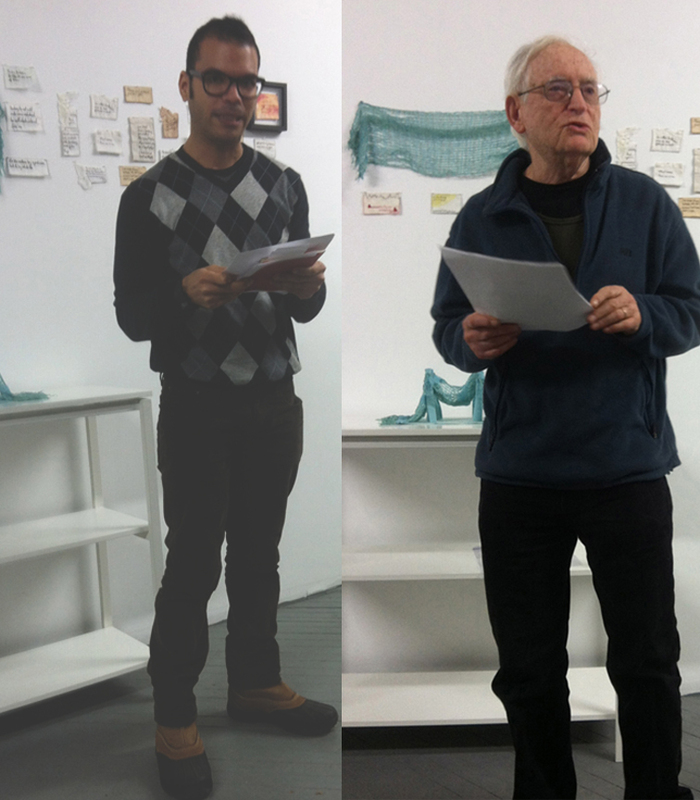 At a final, culminating event for @EmbroideryPoems, Weaving Hand in the Navy Yard, Brooklyn neighborhood hosted an exhibit of my woven and embroidered poems, and local (Monte Olenick and Montana Ray) and not so local (Octavio Gonzalez) poets read their works. 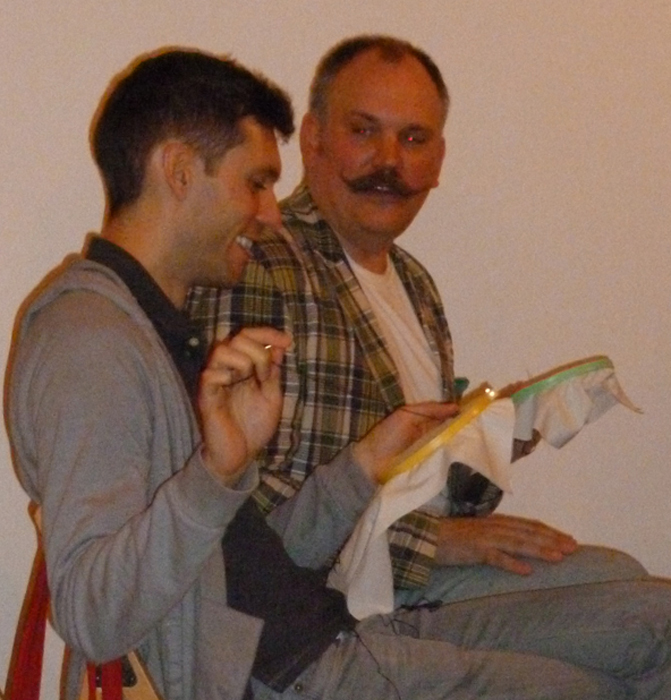 Octavio Gonzalez and Monte Olenick recite poetry at final Embroidered Poetry Reading for @EmbroideryPoems. Hosted by Weaving Hand. 2013 @EmbroideryPoems project written up in Strange Material by Leanne Prain.